I just returned from the Microsoft TechEd conference in Orlando. While there, I gave two talks and presented a Preconference tutorial. During the preconference tutorial, I discussed changes to the Windows Mobile 6.1 memory model. Here is a short summary of the changes. Despite the implication of the “6.x” version number, Windows Mobile 6.1, like Windows Mobile 6 and Windows Mobile 5 are based on a modified Windows CE 5.0 kernel, not the newer Windows Embedded CE 6 kernel. 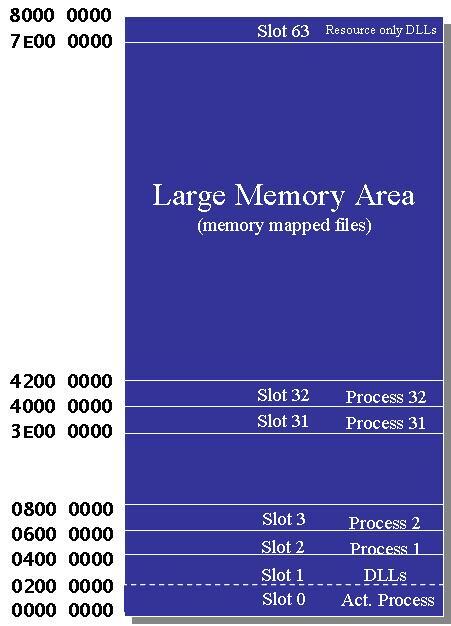 The “old” kernel uses the slot based model for memory management shown in the figure below. The problem with memory in Windows Mobile has always been the vast number of DLLs in the system. DLLs are loaded from the top of slot 1 down. Since there are so many DLLs in the system, not only do they fill up slot 1, they encroach into slot 0. This leaves only about 18-20 Meg of virtual space for each application. This problem is most acute in the Device Manager process space where dozens of device drivers, each with their own interrupt service thread, tended to consume most of the virtual space in that process. This slot arrangement remained pretty constant from Windows Mobile 2003 to Windows Mobile 6.0. However, with the release of Windows Mobile 6.1, things were changed to reduce the DLL pressure and to help out in the Device Manager process space. In Windows Mobile 6.1, the stacks for the device manager are no longer allocated in the processes’ slot. Instead, the operating system uses slot 59, at the top of the Large Memory Area, for the device manager thread stacks. The shared heap slot was added in Windows CE/Windows Mobile 5 but its addition wasn’t an attempt to solve the DLL problems with Windows Mobile. 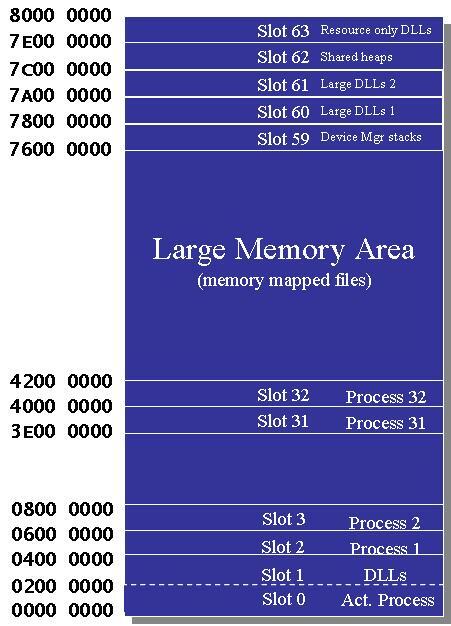 While in this diagram it looks like the large memory area has been shrunk significantly, it really hasn’t. The LMA size, which is close to 1 GB was only reduced 128 MB. To take advantage of this change, OEMs who build Windows Mobile systems need to adjust how they assign DLLs in their .BIB files. Now, large DLLs should be moved from the MODULES section of the .BIB to the FILES section. This change prevents the tools from converting those DLLs to XIP. DLLs smaller than 64 KB should be left in the MODULES section. Third party application developers really don’t have to do anything to take advantage of this new arrangement. It has always been good practice to combine DLL code into a few, large DLLs. Now, if that DLL is larger than 64 KB, it’ll be loaded in one of the upper slots. This won’t change the way DLLs operate, its just you may notice some rather unusual base addresses for DLLs when you start debugging your application on Windows Mobile 6.1. This entry was posted in Windows Mobile. Bookmark the permalink.